December 31st: Out of 31 days in December, I’ve managed 27 posts. Didn’t make it every day, but pretty close! So it ended up being 27 days of the mundane. I think my birthdate is pretty fun. This year it was pretty laid-back. I spent the morning running errands like a crazy person since I didn’t have the kids with me. How hard is it to find a chocolate brown cardigan with 3/4 sleeves? Pretty darn hard. This afternoon, Hannah and I went over to a friend’s house to exchange Christmas gifts and ended up staying awhile to watch baby sister and little brother while big brother went to urgent care for some crazy stomach pains. It was cute to watch Hannah and little brother play together, he is about six months older than Violet, so it is fun to get a glimpse of how playing will be different in a few months at our house. And of course sweet newborn time. 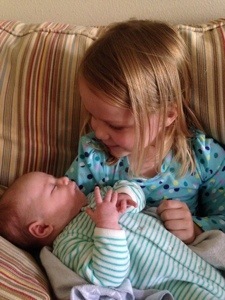 All seems to be well now for big brother, so hopefully they will enjoy a quiet evening. 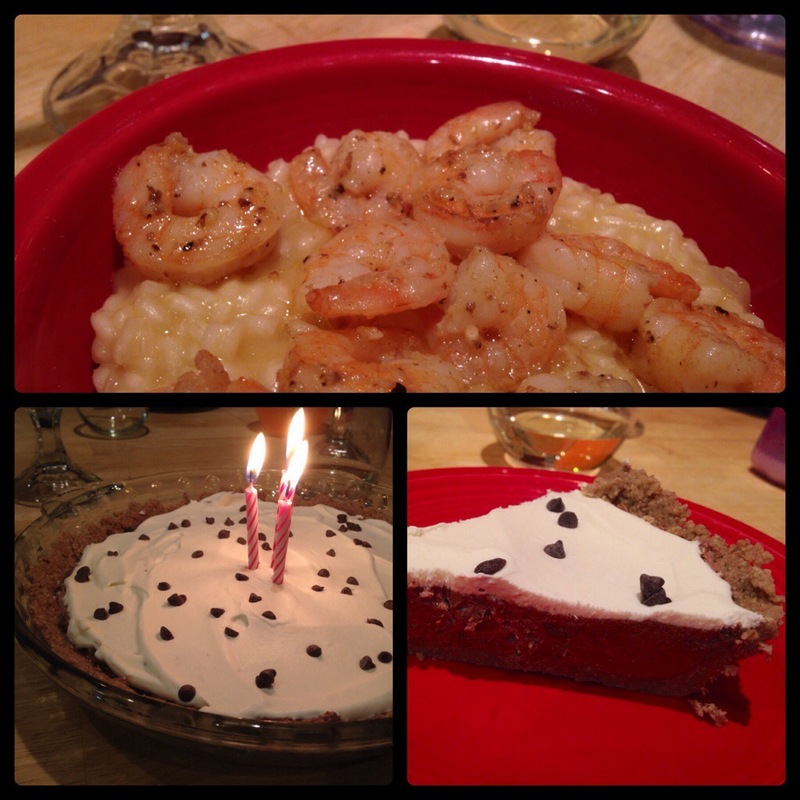 For my birthday dinner (because going out on New Year’s Eve is a little crazy), I made risotto and shrimp. For dessert, a chocolate cheesecake pie. So instead of graham crackers, the cheesecake crust was made of pecans, sunflower seeds and coconut oil, and it was yummy! Risotto is always tasty, and the shrimp was a treat. December 30th: The office move is stabilized, and Brett is home for the next couple days! Had to catch up on giggles and tickles, and Costco coupons. December 29th: Brett has worked every day since Christmas. He had a very late night on Friday, setting up the network, and it’s going to be another late one tonight. He is thankful to have some extra help from a part-time former co-worker who is familiar with the systems and is available for big projects like this. Things were going pretty smoothly, but some electrical issues were discovered this afternoon. Moves are complicated already, but they are also dealing with new construction problems. Temporary chaos. The last few days have been weird at home with Brett gone so much. We are also off our normal routine. When Brett went back to the office this evening, after being home a quick hour to eat dinner, Hannah crawled on the couch next to me and cried. It was past her bedtime, and she was missing Daddy. So we ate up the pumpkin cheesecake in the fridge. These were supposed to be vacation days for Brett, but his bosses said he can carry them over to next year along with the other people who have been working extra for the move. We’re all looking forward to the days off mid-week coming up. Hopefully everything will be in good shape by then for him to have a good break! December 26th-28th: Brett’s office is moving to a new building, so he has been working overtime this holiday season. 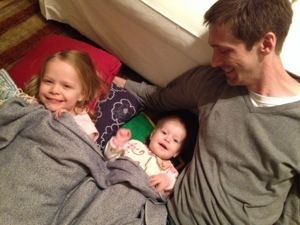 That means lots of time at home for me and the girls. 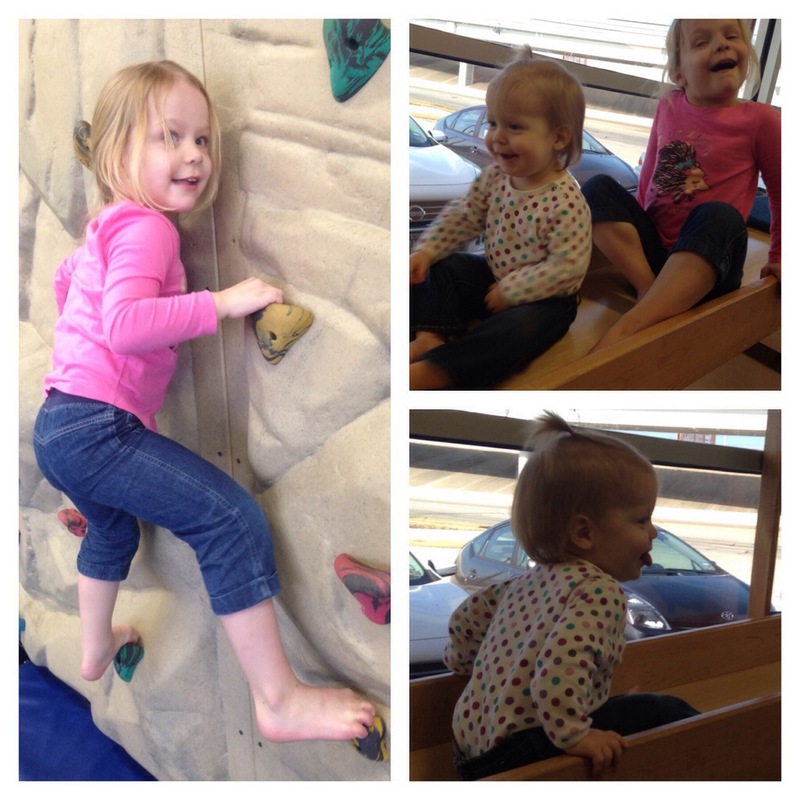 Today we headed to “My Gym” to get some wiggles out. I got a Groupon to “My Gym” last summer; they were offering passes to their “Active Play” room. It’s a large room set up with all kinds of gymnastics equipment, and you can drop in whenever and play as long as you want. This was perfect for the summer when it’s too hot to go to the park. We used up our allotted Groupon visits over the summer, and Hannah kept asking to go back. Then, some family members gifted us with a membership for Christmas. December 24th and 25th: Christmas festivities! Daddy home during the week, Christmas Eve service, tamales, Uncle Michael visiting, hot apple cider, a fire log, watching Elf, stockings of treats, homemade cinnamon rolls, piles of presents from loved ones, lots of giggles and playtime and eating. 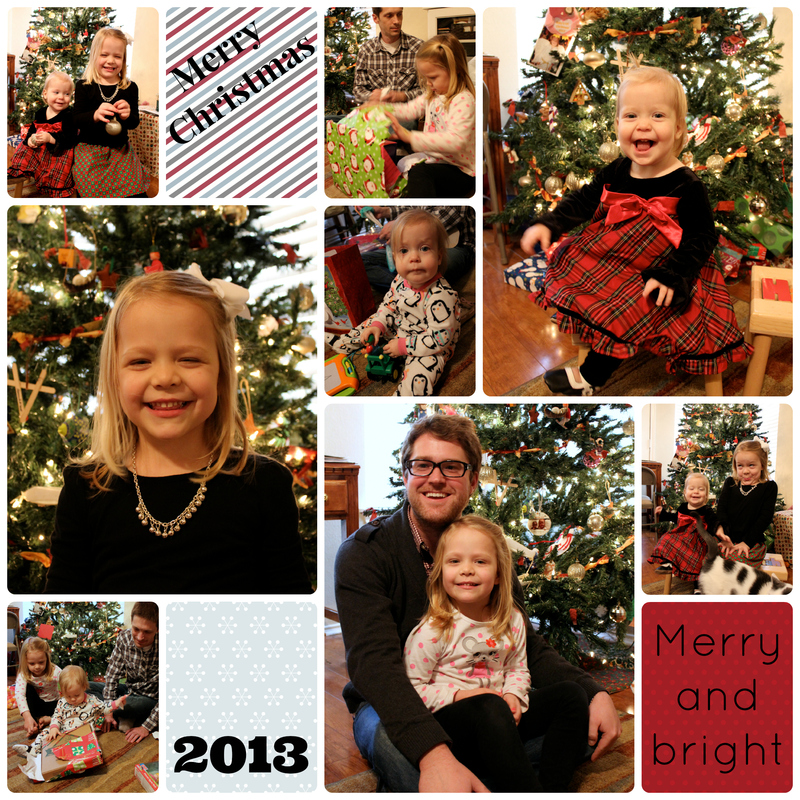 Merry Christmas from Olive Street! 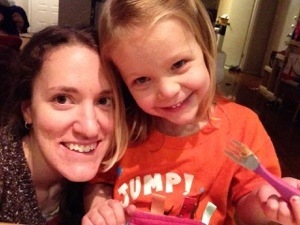 December 22 & 23: Four years ago was Hannah’s official adoption day. I did a blog post describing the process. 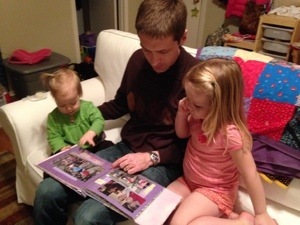 Now, each year, we celebrate by having a special sweet treat and looking through the Adoption Day scrapbook I made. I like having an open adoption for the same reasons I like not doing Santa: we don’t have to keep up any stories or avoid any questions. Just answer things truthfully as they come. After all, the truth, whether it is the amazing gift of adoption or the gifts lovingly chosen by your parents, is more wonderful than the charade. We made two-ingredient fudge which is pretty tasty. After dinner, we drove past a house that features train sets in the Christmas decor. It is tucked away on a cul-de-sac and wins the neighborhood award every year. It is truly fantastic. Three running train sets with sound effects! 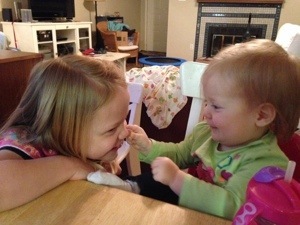 This occupied them for quite a while with many giggles. Then we hit a cheesesteak restaurant for kids eat free night. December 21: Brett’s new office building is nearing comepletion, and he has started moving things over. The big official move is next weekend, but he has several things that need to go over sooner. This morning, he was setting up the server rack. It was a bummer for him to miss our usual Saturday pancake breakfast, but we got to check up on him. The security system is connected to the network, so Brett pulled up the camera in the server room on his iPad before he left. 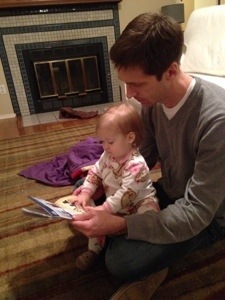 Then we were able to click on an app and check on Daddy. This was pretty exciting and kind of weird. We were also able to talk to him through the system. 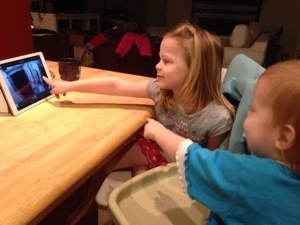 The girls loved to see him on the iPad, so it was a fun thing to try. Brett says it was a little weird to think of people watching him. This evening, we had a big “first.” The ballet studio where Hannah and I take classes was doing a performance. The “baby classes” and the adult classes were not involved, so we were just spectators. Hannah picked out her fanciest dress and requested that I paint her nails before we go. I didn’t have the heart to tell her everyone else would be wearing jeans, including me, and she didn’t seem to notice. It’s exciting for me to see her gaining the maturity to enjoy special things like this. We made it through a 30-minute dance program, someday The Nutcracker!